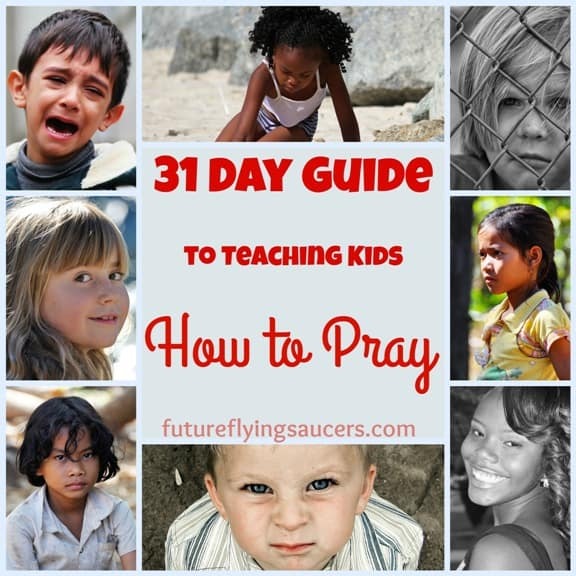 Teaching Kids When to Pray | FutureFlyingSaucers. When should we pray? How do we teach that to our children? When do you pray? 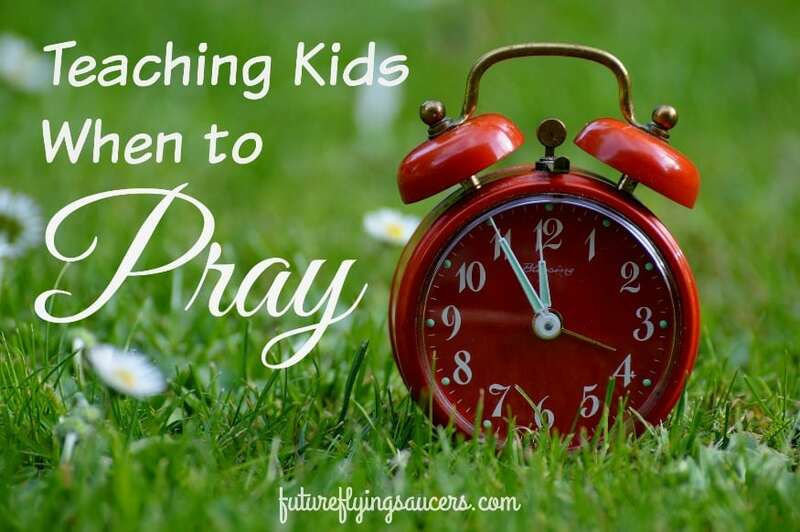 Do your children see you praying? The book of Daniel tells us that he prayed a certain amount of times a day. I came up with four main times when we should pray. Our children will learn how often to pray by watching how often we pray. God’s mercies are new every morning. Wouldn’t the Lord love it if we woke up saying, “Good morning, Jesus!” At some point during the morning, be sure to gather everyone together and pray for the day. Ask for God’s peace to dwell in everyone’s hearts as they go throughout the day and lift up any known needs. If you have littles whom you still dress, consider talking about the armor of God as you help them put on each item of clothing: pants, shoes, belt, hat, etc. This is a great way to begin the habit of putting on the whole armor of God each day. Matthew 14:19 shows Jesus blessing the food before handing it out. We should do the same thing. Food gives our bodies health and life. God cares about our lives and he’s the one who provides the food. Saying mealtime prayers is a great way for your children to practice praying aloud. While I don’t think you need to use the same mealtime prayer every meal, I do think you can use scripture to help create meaningful blessings. Choosing parts of Psalm 104 is a great start. You could also lead your family to sing the Doxology. Always strive for peace in your home. Teach forgiveness and patience. You want your house to be a safe haven for your children. You want them to be sad to leave and happy to come home. When leaving for an extended amount of time, pray as a family that God will guard your home. He provided everything and, yes, he could take it away. But you can pray to the One who gave it and thank Him for the blessings that are held inside the walls of your home. When you return, thank the Lord for blessing you with a home to which to return. The best conversations you will ever have with your children will probably come at bedtime. This is when they tell you about their burdens, hopes, feelings, uncertainties, and questions. Bedtime routine takes almost an hour at our home with 3 children. There are days when it can be burdensome in and of itself. But I know that what my husband and I are doing these first years of life with our kids will be foundational for their prayer lives of the future. Maybe There are More Times to Pray? Model prayer during bad times, good times, in urgency, when you are discouraged, and…ALL the time. To help you begin the process of praying continually, try this exercise with your children. The next time you hear a siren, or see emergency lights, particularly an ambulance or a fire engine, stop what you and the children are doing and pray. Pray for the person who might be hurt. Pray for the paramedics that they might help the person. Pray for the firemen, that God might keep them safe. Once you model this a few times you will find that your children will jump at the chance to pray.